Before you get excited this is not a comeback attempt at the Grand National. 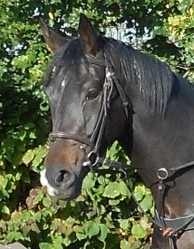 Kingscombe went to the Heathfield Show with Karen on Saturday to compete in the ROR classes (Retraining Of Racehorses). 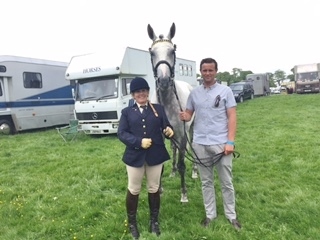 He did really well with a win, two seconds and a third place in the championship that qualified him for the finals at Aintree at his first attempt. Kingscombe with Karen and Ben. Mab Dab back to form. Mab Dab put his recent disappointing Kempton run behind him by finishing second in a 3 mile 1 furlong handicap hurdle at Fontwell today. He was possibly aided by the increase in trip and return to a left handed course. Under Jack Sherwood he was switched off at the rear of the bunch for the first two circuits. He was asked to take closer order going out on the final circuit and initially looked to be struggling. 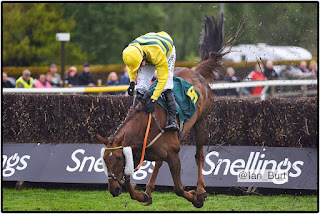 However he gradually responded to his rider's urgings and, jumping fluently, he made his way forward to share the lead with the eventual winner nearing the bottom bend. The winner was travelling easily and pulled away leaving Mab Dab to fend off the challengers. This he did all the way up the home straight, gamely holding on to second place. 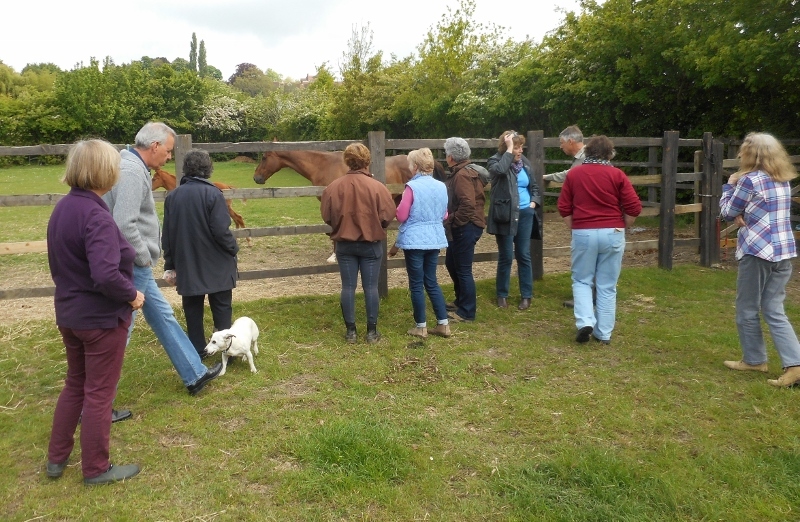 There were several generations at the yard this morning to help Tony celebrate his recent success with Madam Anna. Along with the regular Saturday morning owners they enjoyed champagne, smoked salmon, nibbles, the regular breakfast and a cake in Tony's colours before going down to the track to watch Madam Anna canter a few circuits. A glass or two raised. Grandchildren meet a some horses. Madam Anna struts her stuff. 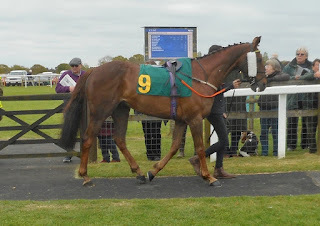 It was Ladies Day at Plumpton today so it was fitting that Kayflin should put in a good performance. 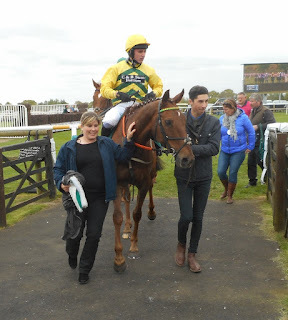 She was the outsider of the six runners in the 3 mile 1 furlong handicap hurdle, ridden by Jack Sherwood. The race was run at a crawl over the first two circuits with Kayflin lobbing along sweetly towards the rear. As the pace picked up she moved forward down the back straight taking second place entering the railway bend just behind the eventual winner. They moved away from the others up the home straight, but the winner was always holding her and Kayflin had to settle for a creditable second place. On top of that Ollie won "Best Turned Out" with her. However, not to be outdone, Madam Anna, making her racecourse debut went one better in the closing bumper. 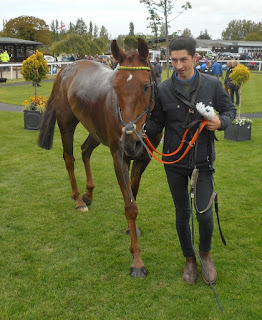 Again ridden by Jack Sherwood she spent the first circuit towards the rear of the tightly packed 7 runners. She moved closer to the leaders down the back straight second time round and moved into the lead round the bend. In truth it was quickly all over as a contest and she ran out a very easy and impressive winner. So the two girls did brilliantly on Ladies Day. 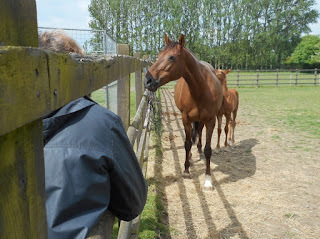 She's Humble enjoyed the attention that she and her foal received at the yard today. She was making the most of it as she is off to be covered again in the next few days, this time by leading sire Kayf Tara. 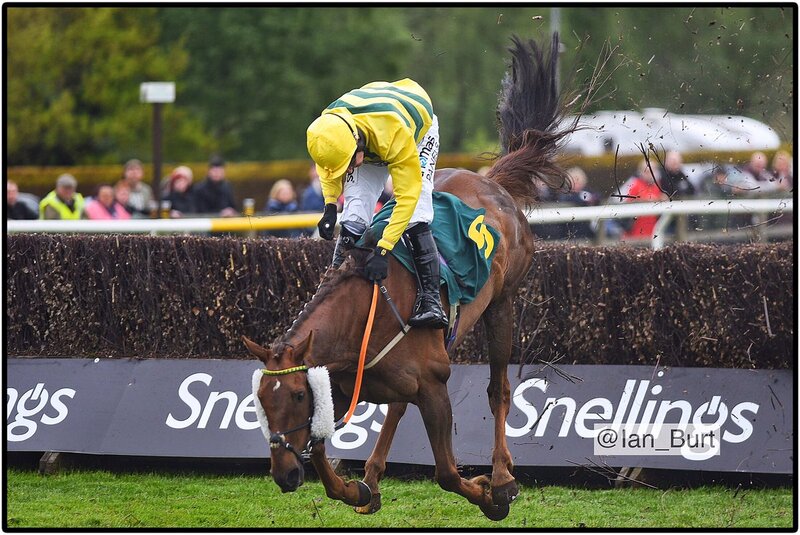 After finishing second three times in his races since November another second place today might seem disappointing or frustrating for Itoldyou, but not a bit of it! This time he was taking on higher class individuals in the Norfolk National, a valuable Class 3 handicap chase. 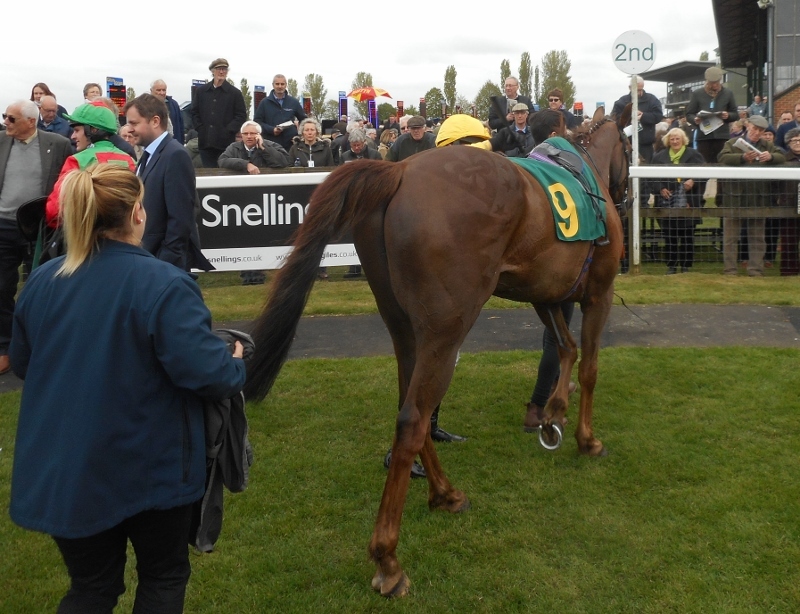 Ridden by Jack Sherwood, claiming 3 pounds, he set off in the middle of the 10 runners but quickly established a position well in touch in 4th place. For much of the race he travelled in 3rd or 4th place close to the eventual winner. The ground had become "good to firm" and the faster pace might have accounted for slight jumping errors at the 14th and 16th obstacles. Going out on the final circuit he was maintaining his position as 6 horses moved clear. At the end of the back straight he had a share of second place which he cemented after the open ditch. Rounding the home turn he moved clear of the chasing pack but was still a few lengths down on the leader approaching the last. 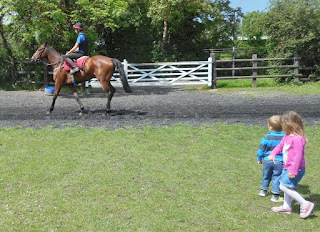 Here he seemed to have a difference of opinion with his jockey, deciding he couldn't manage the long one he was asked for. 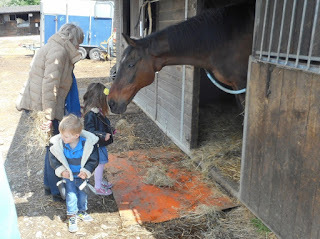 He hit the fence hard but somehow Jack stayed glued to him and Itoldyou found a leg to stay upright. The mistake didn't slow him and he ran on to the line going down by 5 lengths but 7 lengths ahead of the third placed horse. This was a prestigious and valuable race and even second place earned him over £4000. This takes his winnings past the £50 000 mark. 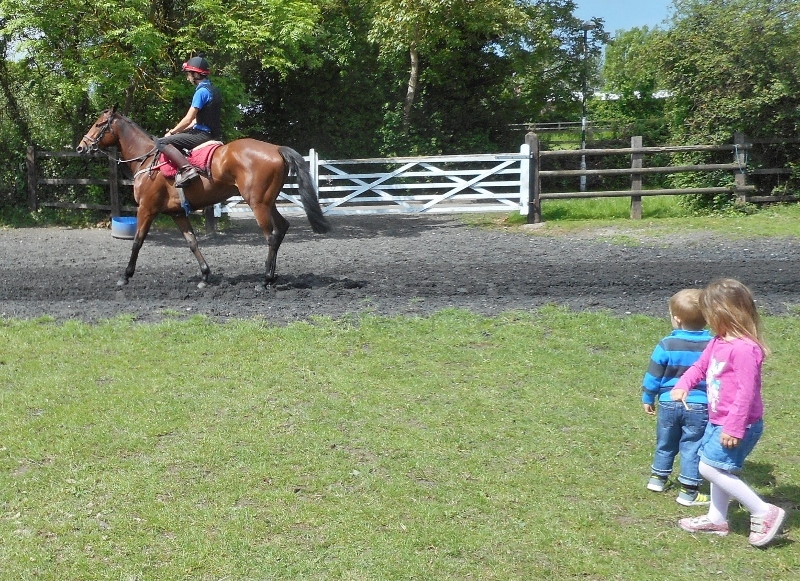 On top of all that he was awarded the "best turned out" prize of £50 which Alex gratefully received. All in all a great day. Almost giving it away at the last. Well sat! Karen and Alex lead in the hero. Taking his place in the 2nd spot. Totally chilled out after the race. After nearly two years off the track Breden showed that he hadn't lost his ability when running a fine second in a Class 3 (0-95) handicap over an extended mile at Windsor today. Ridden by Robert Tart he was slowly away and trailed the other eight runners in the early stages. 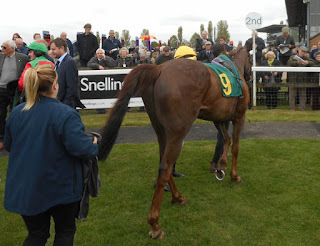 He took closer order at half way and made progress through the field approaching the final couple of furlongs. 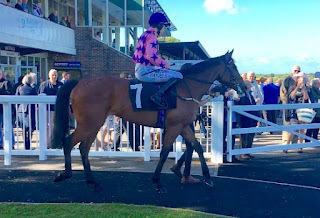 He found himself short of room but ran on strongly when a gap appeared to take second place, one and a quarter lengths behind the winner, at the rewarding each way price of 25/1.